Today, we wanted to share with you some fun karaoke songs recorded by our students just like you who are using Mingoville to learn English in a fun way. 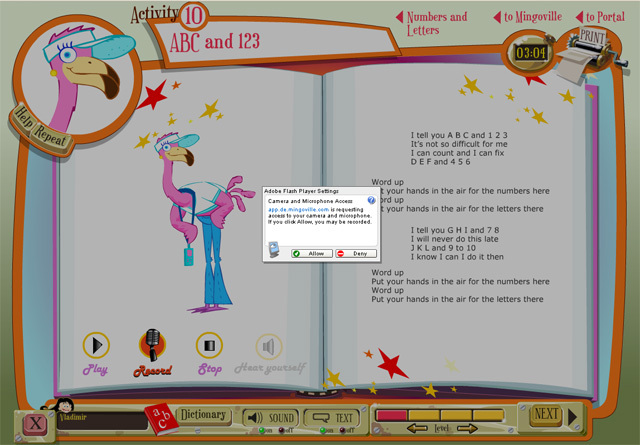 As you might have already explored, inside the Mingoville program we have Karaoke songs inside each of the 10 Missions. 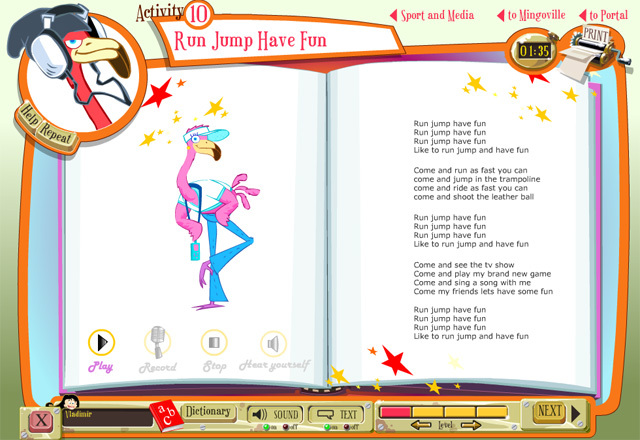 For example, here is a snapshot of the song “Run, Jump, Have Fun” in Mission 10 – Sport and Media. Now, we want to show you how other Mingovillers sing these songs, record themselves and that is all while having lots of fun. Have you listened to Danijela and Jannick sing? If so, good, because we want to encourage you to record your version of Mingoville songs. It is fun! When you click on the “Record” button, you will see a pop-up window as part of the Adobe Flash Player Settings, press the green button “Allow” and start singing. Your songs will be stored in your profile and you can always access them at any time.